NOTE: Please excuse a few surrealistic pictures, but when I ran this route the first time, on a dark December evening, I was hit by a sleet-storm. I ran it again on a nice May day and got the nicer pictures! I've been working in Munich a lot lately, and here's a scenic route that I've discovered. It covers lots of the classical (Greek revival) buildings in the area just north of the town center, around the universities. This area was purposely filled with Greek-inspired buildings and monuments back in the 1830s because the Bavarian royal family, the Wittelsbachers, also provided the king for newly independent Greece. 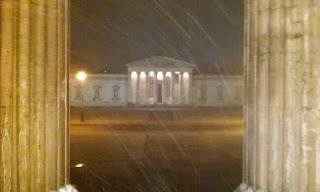 So, to cement the connection, Munich was filled with classical buildings in the new neighborhoods between the town center and Nymphenburg palace. Unfortunately for the Wittelsbachers, the first king of Greece, Otto I, was soon overthrown by a revolt, had to escape back to Bavaria, and that was the end of the Greek adventure. 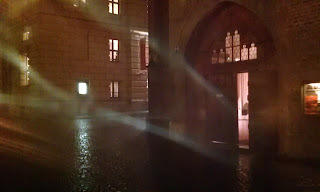 This route starts at the Odeonsplatz, in front of the old Bavarian royal residence, on the edge of the old town. The monument flanked by stone lions is the Feldherrnhalle, honoring some generals of long ago. The big yellow church is the Theatinerkirche, burial place for the royal family, including the unlucky Otto of Greece. Start the run by going to the front door of the church and turn left. Run straight south on Theatinerstraße until the first side-street on the right, Salvatorstraße. Turn right and run the one block to the old red-brick Salvatorkirche, one of Munich's oldest churches. Run straight past the church, then turn right to go into the churchyard at the church's main entrance. The building just past the church is the Literaturhaus, an ex-school now devoted to books, with its own literary café for bookworms. It's amazing what the city spends its money on. At the end of the courtyard, turn left on Jungfernturmstraße. Immediately on the left, you'll see a section of the old city walls, one of the few left standing. The street runs into Maximiliansplatz, a wooded square. Run into the square, turn left and run till the first cross street, Max-Joseph-Straße, where you turn right. It heads straight to a big obelisk in the middle of circular Karolinenplatz. Run around the left side of the circle to the second outlet on the left, Briennerstraße. This takes you to a square flanked by two Greek-temple-like buildings, the antiquities museum on the left, and the Glyptotek antique sculpture museum on the right. Both house the kings' collections, intended to turn the city into the German Athens. And staight ahead, standing in the middle of the street, is another temple-like monument called the Propyläen. Run past the antiquities museum on the left side, the turn right to run right by the Propyläen, then turn right again to circle past the front of the Glyptotek. Turn left at the first street, Arcisstraße to run north. You'll run by the Technical University on the left side, and the classical Alte Pinakotek art museum on the right. At Theresienstraße, turn right to run past the Neue Pinakotek on the left side, and the ultra-modern extension on the right, more art museums (and there are more to come!). After 2 more blocks, turn left on Türkenstraße. This is the main university neighborhood, with a second university -- the Ludwig-Maximilian-University -- spread throughout the area. 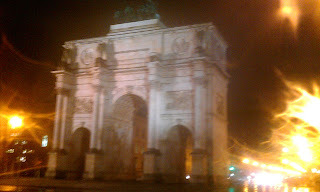 When you reach Akademiestraße, turn right and run past the Academy of Fine Arts palace, running straight towards the Siegestor, a triumphal arch. Cross the busy Ludwigstraße at the arch, then turn right to run to the main university buildings. You are now running straight back to Odeonsplatz. 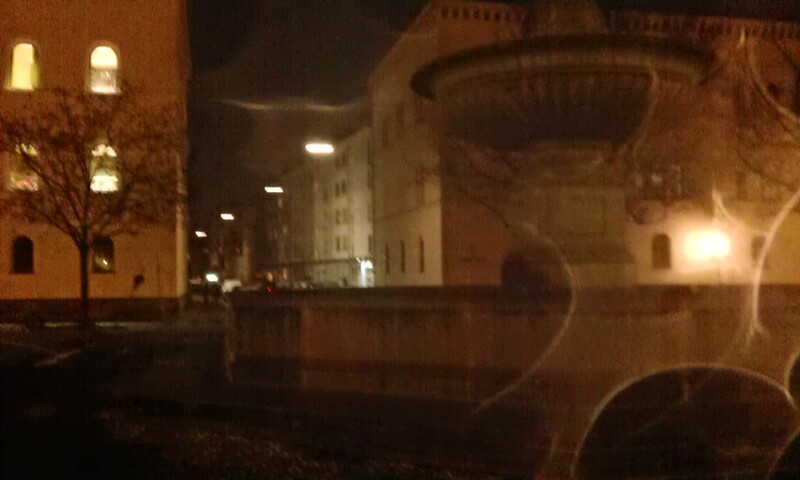 But at the spot where the twin fountains flank the street, turn left to run down Veterinärstraße. 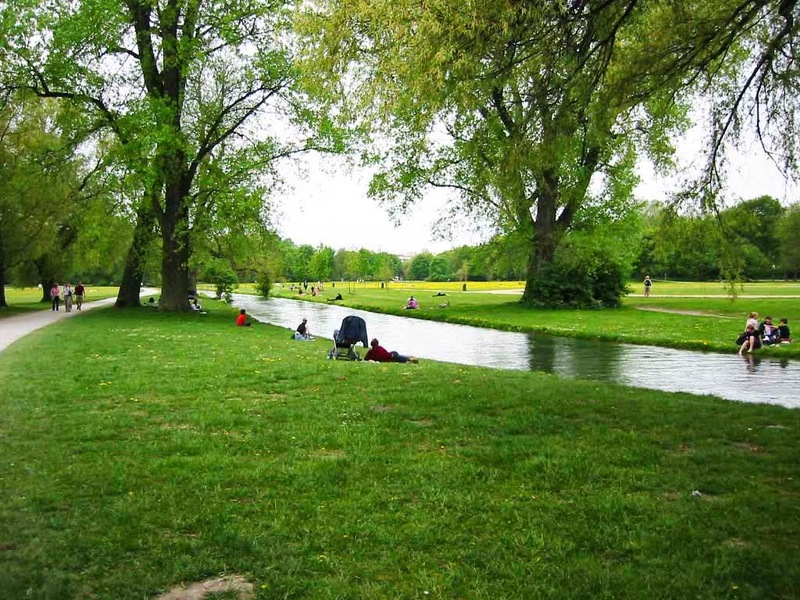 Run straight into the park until you cross the stream running through the great lawn. You'll see the white-domed Monopteros belvedere (lookout gazebo) crowning the little hill across the lawn. Turn right on the path that parallels the stream, heading south all the way through the park. When you reach the southeast corner of the park, you'll hear, then see the loud whitewater and a group of surfers surfing the standing wave that's always there in the stream. The surfers are there day and night, and are always good for some entertainment. At the end of the park, turn right on Prinzregentenstraße. You will now run past the huge, columned facade of the Haus der Kunst art museum (how many art museums does one town need, anyhow?). When you reach the far end of the museum, turn left to cross the street and run south along Franz-Josef-Strauß-Ring. There is the Staatskanzlei building on the right side, housing the Bavarian prime minister's offices. It's an interesting mix of two modern, glass wings with a classical stone domed section in the middle. 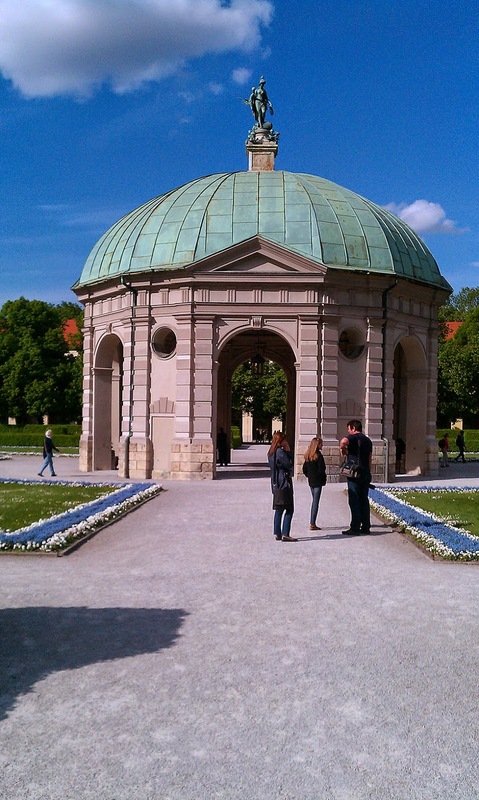 At the south end of the Staatskanzlei, turn right to run on Hofgartenstraße, which runs past the main facade of the royal residence, with its formal gardens and Temple of Diana gazebo to the right. When you reach the far end of the residence, you'll find yourself back at Odeonsplatz.